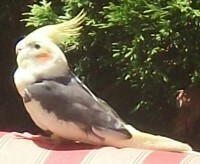 Bird was found sitting on chair in our backyard. It climbed onto our finger when we put our hand out. It does not appear injured in any way and seems very friendly. It has not made any sounds since we found it. It is banded, so the rightful owner should be able to confirm the band number. We just found the bird today and would love to help it find its’ owners.